French painter. He painted his first landscapes and family portraits at Thiers and in the Auvergne before moving to Paris in 1829. After working as the pupil of Camille Roqueplan he was engaged by Baron Karl von Hgel for an expedition to the Near East (1831-33), from which he brought back numerous studies. He visited Greece, Syria, Lebanon and Palestine, stayed in Egypt from October 1831 to May 1833 and returned by way of Rhodes and Corfu. Cairo, the villages of the Delta and Upper Egypt proved to be sources of inspiration for later works. At Alexandria he painted theatre sets and numerous court portraits. Despite further trips to Italy (1835), the Midi, the Pyrenees (1836) and Normandy (1843), the Near East and the Auvergne remained his major themes. 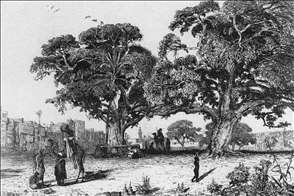 Ezbekiyah Square (c. 1835; engraving in Bibliothèque Nationale, Paris), the Recollection of the Countryside near Rosetta (1835; engraving in Bibliothèque Nationale, Paris) and the illustration of the Countryside near Luxor published (1835) by the engraver Lon de Joannis (fl 1808-50) brought him to the attention of the public. Although Twilight (1836; untraced, engraving in Bibliothèque Nationale, Paris) was refused by the Salon in 1836, his pastel drawing of the Villa Pamphili (private collection) was engraved by Eugene Ciceri (Bibliothèque Nationale, Paris). He died, insane, aged just thirty-six. See more details about "View of Ezbekiyah, Cairo"